Ginger Chalford Metraux, Ph.D. has been the channel for Galexis since 1988. Ginger has walked the metaphysical, occult, and mystic path for 50 years, practicing professionally as a nationally known astrologer, spiritual life coach, teacher, healer, and more. From vast metaphysical experiences, studies, trainings, personal inner work, as well as the Galexis Material, Ginger is the Mystic Professor, writing articles and newsletters ranging from mysticism to holistic health to practical New Life Manifestation. Ginger was born in Tennessee to strongly religious parents. Being deeply spiritual but rebellious by nature, she started her journey of self-discovery away from Tennessee and the Christian way. Through the decades of her youth and middle years, Ginger learned about and practiced Surat Shabd Yoga (Yoga of the Divine Sound Current), fasting and high vibration diets, naturopathy and nutrition, transactional analysis (TA), art (commercial and illustrative), music (both classical and pop, performing and writing), NLP (Neuro-Linguistic Programming), the MariEl Healing System, Quantum Touch healing method (where she learned to heal by her gaze), Spiritualism and the occult, applied/psychological kinesiology, and shamanism. She studied with Lazaris (see Lazaris.com) through workshops starting in January 1980, and for several years with Dr. Gregory Antyuhin, a medical intuitive from Russia, in his Modern Day Mystery School in Boca Raton, Florida. She began channeling directly upon taking the Channeling course offered by renowned medium Alexander Murray of New York. 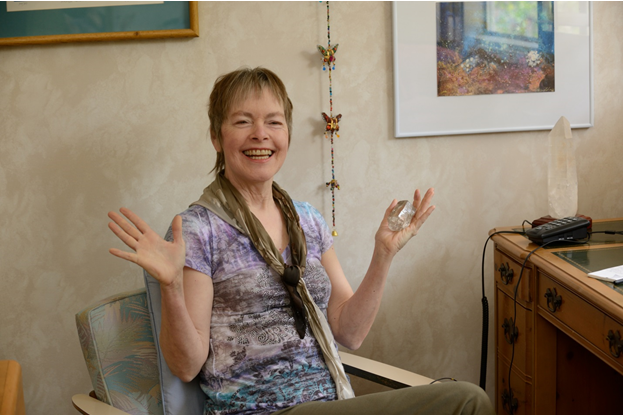 As a professional counselor, she has received and given psychic healings of various kinds, including shamanic style, Quantum Touch, Reiki, and more. Her interests include writing, researching, and spending time in nature. In 1984, Ginger received her doctorate from Walden University (now Excelsior College in Albany, NY). Her doctoral case study was how emotional changes affected visual acuity. After that, she began a series of classes called Imagix, and began sharing her wisdom in informal but deep-shifting coaching sessions. For several years, Ginger was a prominent national astrologer, speaking as a faculty member at SEAC, AFA, and NCGR conferences. She is the author of two astrological books, The Inner Personalities of the Chart, a study of Transactional Analysis and Astrology, and Pluto, Planet of Magic and Power, a look into the nature of personal transformation as symbolized by (the now non-planet) Pluto. Ginger is married to Daniel Metraux, aka Daniel the Healer, who manages the business side of Galexis. They currently live in the Los Angeles area.